PHOTO: Allen Ramsey, DWCPhoto.com. Highlands senior Colin Ginter (20) makes a move in a recent game. 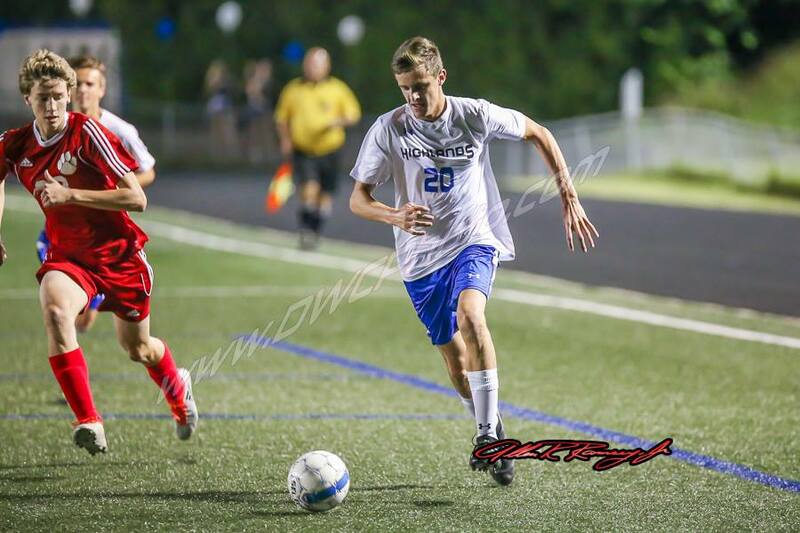 Ginter had an assist on the game's lone goal Thursday against Ryle. To get your sports fix like this article, you can click the sports tab above (desktop version) or head over to FTMSports.com. The game may not mean as much in a few weeks if these two teams meet again. But it definitely helped that the winner finished unblemished in 9th Region action. Both the Highlands Bluebirds and Ryle Raiders soccer teams entered the Thursday battle with no losses and one tie each in region action. The Bluebirds (15-2-2) ended up leaving Tower Park with that great feeling in a 1-0 victory over the Raiders (15-4-2). Highlands finished 10-0-1 in region action with its lone tie coming against Cooper to open the year and Ryle finished 6-1-1 in region play with its tie coming against St. Henry. "This team can challenge anybody's that's around now," said Matthew Winkler, Highlands Head Coach. "We're playing well right now. It's fun to get one more win on the board. Ryle is a nice tune-up to make sure we're where we need to be for next week." Both teams played physical. Ryle drew 15 fouls including a yellow card and Highlands had 14. Both teams also drew two offside penalties. The Raiders outshot the Bluebirds, 11-6 including 5-2 on goal. But Highlands senior goalkeepers Paul Tully and Simon Frink recorded three and two saves respectively as the Bluebirds blanked their 13th opponent this year. Ryle played three different goalkeepers. But Highlands made the most of its opportunities. With 22:34 left in the first half, senior Colin Ginter centered the ball to Colton Dolezal in the middle of the 18-foot-box to score the game's only goal. That marked the eighth goal for Dolezal and third of the assist of the year for Ginter. "The main focus was staying focused and getting the W," Dolezal said. "We knew it was going to be a hard one, especially on the offensive side because we knew Ryle is a good team. We took our chances well. We knew we had to execute our plays well." Highlands won its share of 50/50 balls near midfield to limit the Raider opportunities. The Raiders finished with eight corner kicks to two for the Bluebirds. "Our defense always comes up big every game," said Aaron Williams, Highlands senior midfielder. "We bring the intensity from the start, continue it through the half, never look back and keep on trucking." Ryle did have a few good opportunities in the second half. But Frink denied the Raiders every time. Highlands takes on George Rogers Clark (8-7-4) to finish the season Saturday. Game time is Noon. The fourth meeting against the Lady Cougars (11-11) proved to be the charm for the Ladybirds (17-14 overall). Highlands ventured to Hebron and recorded a 25-11, 25-19, 26-24 victory to move to 9-7 in 9th Region action and equal the win total of the previous two seasons. Conner had beaten Highlands twice in the Cake Classic and once in the September Slam Tournament at Scott High. "The senior leadership is really strong," said Emma Little, Highlands senior setter. "We have been playing with the same girls for all of high school and it's finally clicking. That's helped us communicate and get better." Little had another great game with 43 assists. Senior Lauren Epperson had 18 kills and three aces with junior Gracie Schweitzer leading the defensive charge with 22 digs for the Ladybirds. The Ladybirds take on Bellevue on Monday. Game time is 7 p.m. The Bluebirds improved to 4-3 on the season with the victory. They take on Boone County on Thursday at 6 p.m. in Fort Thomas.